Are the best biscotti in America made in the North of Michigan by a non-Italian baker? In our experience, that just might be the case. They’re so good, we can’t stop dreaming of them—every single flavor, not just the Double Dark Chocolate Biscotti, above. Photo by Corey Lugg | THE NIBBLE. WHAT IT IS: Part II of our Top 10 specialty and gourmet food picks of 2009, selected from our Top Picks Of The Week. WHY IT’S DIFFERENT: While we love all of our Top Picks, these are the ones that we’ve integrated into our daily lives. WHY WE LOVE IT: These sweet treats are the best of their breed. We’ve tasted hundreds of products in each category, and it doesn’t get better than this. Every calorie is worth it. WHERE TO BUY IT: See individual listings. CAPSULE REPORT: This is the second part of our “The Best Of 2009”: the Top Pick Of The Week specialty and gourmet food products that have become a permanent part of our lives. This week, our picks are the sweet stuff. Since we’ve chosen “everyday foods,” our list doesn’t include the fabulous boxes of chocolate that are special-occasion buys. But don’t worry: All of our picks are indulgences. You can click to the original reviews via the bulleted links below, or read our “Best of 2009” full review to learn why these have been added to our favorite treats list. Happy New Year from all of us at THE NIBBLE! See all of the 2009 Top Picks. Emily’s Biscuits & Cookies. We would gladly eat these incredible shortbread cookies every day: They are exquisite. In Chocolate Espresso, Green Tea, Spicy Chocolate and more. Read the review. Jeni’s Ice Cream. This would have been at the top of our list, but we can’t afford the overnight freight to get a weekly shipment. 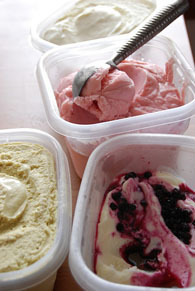 We’re addicted; these ice creams and sorbets are the best. Read the review. Yummy Cupcakes. 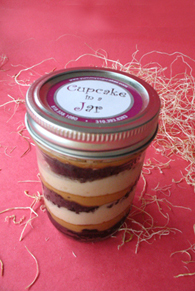 Another fantasy come true: incredible cupcakes, packed into a Mason jar for easy shipping and freshness (they last for days). Happy memories for a lifetime. Read the review. We’ve only mentioned a few items above. See everything that’s appealed to us since we launched the Top Pick Of The Week. With pear vodka and ginger liqueur, this charmer will be a hit on New Year’s Eve. Why do we think our “Best of 2009” are the best? We’ve tasted hundreds of granola bars. None approach the flavor excitement of Olympic Granola Bars. 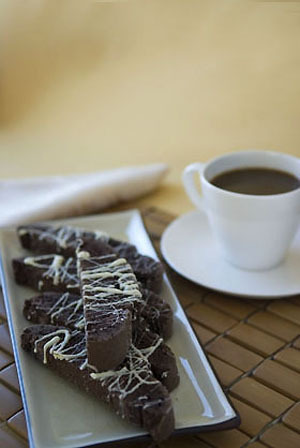 The texture is so brownie-chewy, you can serve them à la mode, for dessert. 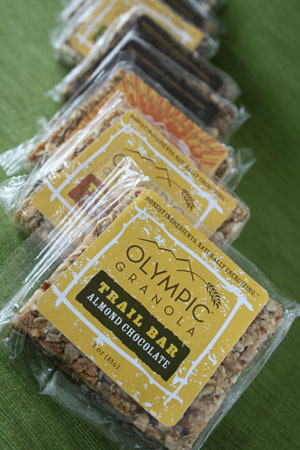 Read the full review of Olympic Granola Bars. These are perhaps our favorite chocolate and white chocolate dessert sauces of all time (although we maintain a great fondness for The King’s Cupboard, which probably takes the lead on the caramel sauce). Read the full review of Somebody’s Mother’s chocolate sauce. No one will ever top Spread in either the number or quality of gourmet peanut butter and almond butter flavors. There are even four flavors for canines. Read the full review to see why we think this is the best peanut butter and almond butter on the market—if your goal is to wallow in sybaritic splendor. The best granola bars: They win the Olympic Gold. Photo by Hannah Kaminsky | THE NIBBLE. Bake incredible cupcakes at home. Photo © Victoria Pearson. We’ve baked and bought just about everything. These are the best. To us, the dark chocolate cupcakes are perfection. 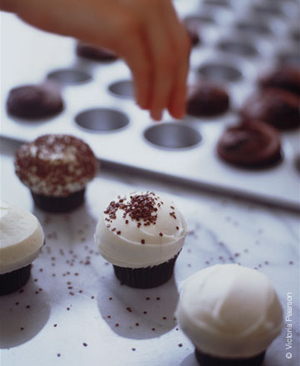 Read the full review of Sprinkles Cupcake Mix. How can it be that a lone chef in northern Michigan—Traverse City, to be exact—makes such luscious biscotti? And why is it that no retailer where we live carries them? The good news is that having to order them by mail keeps us from over-indulging on them every day of the year. The other good news is that they’re so inexpensive, we can afford as many as we like when we place an order. Read the full review of Way North Gourmet Biscotti. 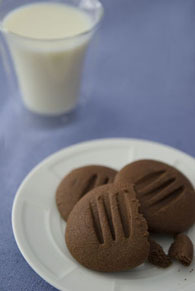 Wishing you as good, or better, gourmet delights in 2010!